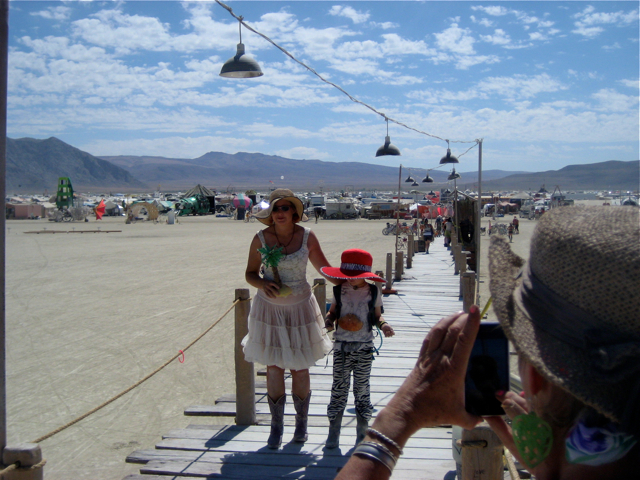 By design, admittedly – but things don’t always come off as planned at Burning Man – we camped this year in between two of our favourite families, neither of whom knew each other especially well. Sadly, the mother in each family had lost a parent this past year, which gave the temple extra resonance. And it may not have been the deciding factor, but each decided to renew their vows with their husband this year out on the pier. (Yes, some bright sparks built a pier at Burning Man this year, complete with Bait Shop/Bar, hammocks underneath, and functioning fishing rods.) One of the couples did so in good humor; the other did so with a registered officiant. Gwen and her son Reed walking down the Pier, I mean the Aisle. Gwen runs the excellent Art Predator web site. That makes it sound organized – and it’s true that they had prepared their vows, and bought both a guest book and champagne. 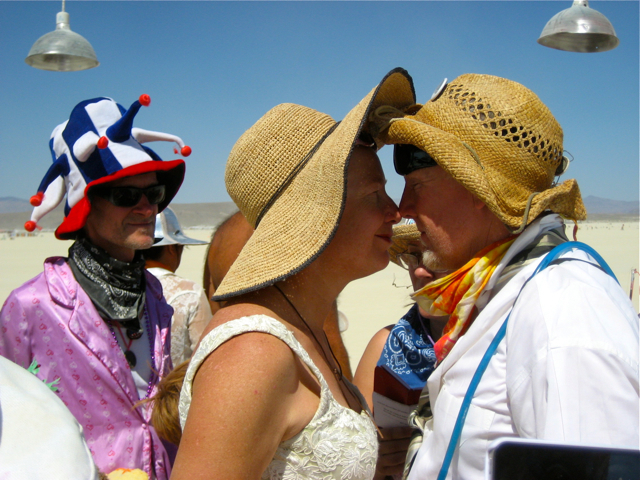 But at the same time, this I Burning Man, and I didn’t know it was happening for sure until Sunday lunchtime, while I was hanging in the shade, and suddenly asked if I would be both Best Man and Maid of Honor. I humbly accepted. I even got dressed up for the occasion – wearing the Playa Makeover clothes I’d acquired two days earlier. Campbell and I then got on borrowed bikes and rode out to the Pier for the ceremony. Gwen and Marsh renewing. Please excuse the crazily-dressed dude in the background. I knew that they were taking it seriously. And I knew they wanted to have fun. I just hadn’t expected them to combine those two elements and to make it quite so bloody emotional. With a small assembly that included a couple of ageing mothers we had corralled from the end of the pier, and with an unwitting audience of younger burners kicking back at the end of the pier, the ceremony was conducted. It was beautiful; it was heartfelt. There were hugs and kisses (lots of kisses), and the couple’s 7-year old son got to tell them how much he loved them. We all cried a little. And then we popped the champagne. If I had been lacking a personal emotional experience at Burning Man this year, I felt that way no longer. Thanks for making me part of it, Gwen and Marsh and Reed. We love you.